This circuit is a modification of High and Low voltage cut off with delay and alarm circuit appeared in Circuitsarena , which I have tried and found to be quite reliable. You can adopt this circuit with small modification. Use a transformer with secondary 15 – 0 – 15 AC Volt at 500mA, for 18Volt relay operation. Normally any modern electrical and electronic equipment can operate with 230 Volt AC supply. That is, it can stand normal voltage operating range of 195 Volts to 265 Volts. It may misbehave beyond this voltage range. You can choose the practical voltage required for the low end high cut off to change over to other phase. Set VR3 for minimum voltage to switch on the relay input voltage is 195 volts. Set VR1 to switch off the relay above a particular voltage 260Volt input. You can use a 100μF 40 Volts good make in parallel with relay for chatter free operation. 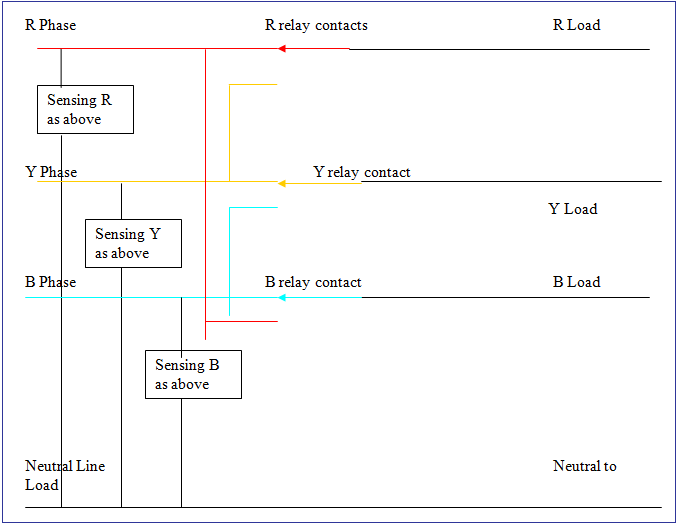 Each Phase you have to use one module as above.The relay interconnections are shown in the connection diagram above. T1 can be a 15-015 V secondary, 230V primary, 500mA step down transformer. 0 Response to "Three Phase Auto Modifier Circuit Diagram"